I love using facial oils and I’ve personally found that they’re very good for me. In fact, in recent times, I’ve been focusing a lot on facial oils and have been neglecting using serums. But happily, the oils seem to be working well enough that I don’t feel the need to use a serum unless it’s a hydrating serum. Yes, I’m afraid even the use of my old standby of the EL ANR serum has fallen on the wayside. It isn’t to say that I’ll never use it again. I will, but in recent times because I’m paring back on my skincare routine for a while, facial oils fill that gap that a serum would otherwise fill, and in many ways, fills it better. 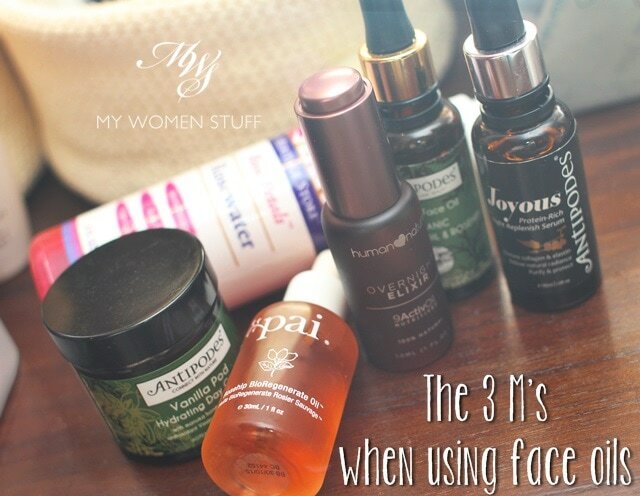 If you have normal-dry skin, then I think you would benefit most from using facial oils. Having such skin type myself, I find that adding a facial oil into my skincare routine actually helps my skin stay more hydrated and look better. Contrary to popular belief, facial oils do not make your skin more oily nor do they clog your pores. Some oils can even help control oil and I know of people who have oily-combination skin who have benefited from using facial oils to rebalance their skin. For myself, I find that I prefer using a blended oil i.e. one that isn’t just one oil e.g. just rosehip oil or just argan oil etc. I find that a blended oil works better for my skin and makes it look better. Some people however, prefer working with singular oils so ultimately it’s about what you prefer. Because facial oils are plant derived and because I know that this isn’t as easy a process as mixing chemicals in a lab, you can expect price points for good quality oils to be higher. As with everything, there are always cheaper and more affordable options but in this case, I do think you get what you pay for, and because you use so little, I think it’s worth it. Like regular creams and serums, oils will absorb more easily into damp skin than dry skin. So, I’m not an advocate of applying oil on dry skin because I find that it tends to sit on the skin without absorbing very well and that can feel uncomfortable and in some cases cause breakouts. You could buy a product that is premixed oil and water like this one from Melvita which is very handy to have or to start your facial oil experience, or you could just do it the easy way with products you may already own. The beauty about facial oils is that they force you to slow down and enjoy the skincare application process. Ok, I’ll agree that not everyone of us has the time to layer on and apply skincare but if you do or can find the time, it can be therapeutic especially in the evenings. This is why I prefer to use oils in the evenings (and also because it can mess with my makeup in the day). To help your facial oil absorb better into your skin, don’t just smear it over your skin as you would a serum or face cream and move on. If you take a little time, just a minute or two, to massage the oil into your skin with your finger tips, you will find that it helps the product absorb more readily into your skin and the oily feeling will disappear and your skin will just feel lovely and supple. If you are concerned or afraid of going to bed with an oily face, then you might be missing out on this step. You don’t have to have a special massage technique (I don’t) although I’m sure it’s more beneficial if you do, but just massaging it makes a difference to the oil absorption, your skin, and your state of mind. It forces you to calm down and slow down. I love it! I also found that when I employ the Mist and Massage technique, oils that used to break me out (e.g. Pai) don’t anymore. I think it’s to do with how much better they are absorbing into my skin. This is more for those of you who might be interested in trying a facial oil but are not ready to put the oil directly on your skin. Or if you have a moisturiser that you particularly enjoy using but because your skin has changed and it isn’t now moisturising enough for you then try this. I find that mixing a drop or two of a facial oil into my moisturiser or face cream helps make the product more acceptable for drier skin. If you have a thick cream, it helps thin it down and if it’s too light, it helps make it feel better. For those who don’t like the feeling of oil on their skin, adding the oil into your face cream means that you don’t have to do double work by first applying the oil and then the moisturiser as it then becomes an “all in one” product. You get the benefit of the oil without the work. In the alternative, you could even mix it with your serums. 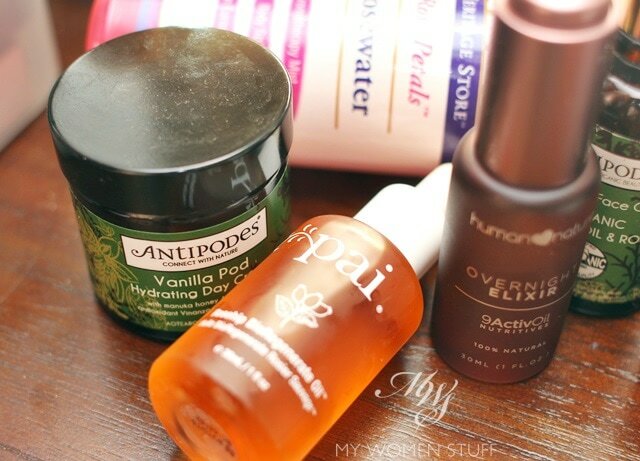 Antipodes encourages this, in fact with their 3 Perfect Potions formula that basically mix their face oil with 2 serums. The ratio of serum to oil is 2:1 and that makes it less oily and helps it absorb more easily. Do you use facial oils? Do you have a tip to share on how best to use it even if it doesn’t start with M? PREVIOUS POST: Your Say: How often do you leave the house bare-faced without makeup? Mixer! I’m a mixer. I like using serums first, and then mixing my oils with a cream. I like that so much better. I find I don’t notice the oiliness so much that way hahaha! I like how it smoothens out creams as well and makes them less thick going on the skin 😀 Yay for oils and mixing! This post comes at a very good time. I was gifted a bottle of Josie Maran argan oil, and I’ve been sitting on it for three months now as I don’t know how to incorporate it into my skincare routine. I’m afraid of breakouts. I’ll try your 3M guide. Thank you. Oils all the way – day and night! My current favourites are Trilogy Rose Hip for day or the Jurlique Balancing Oil. Evenings, I’ve been a loyal fan of Ren Rose O8 (I think?). I only need one pump. I don’t massage or mix – malas (alliteration! Alright! Another alliteration!) – I’ll stop now before I hurt your readers with my lame jokes. I use Lucy Minerals Sweet Dream Serum, which is really a mix of oils. I’m super-duper oily and pimply, but using an oil at night seems to keep my skin soft instead of greasy! And then I rub any residue on my cuticles. I love it. I’ve stopped using facial oils in the last two weeks. My skin has gone nuts and I’m just keeping my skincare simple for now. I find that the weird tiny red bumps on my face tend to get worse if I apply a facial oil 🙁 For the time being, I’m just using cleanser, lotion/toner, light serum and moisturiser. That’s a wise thing to do. When my skin goes nuts, I pare down to the basics too. You know, it might even be that your skin is reacting to the oils because some oils can actually aggravate sensitive skin. Sunny, that means you apply serum before the facial oil? I’m trying to get a handle on using facial oils. Hey Cecilia, yes! Go from the lightest to the richest textures when you layer, so it’s probably serum-oil-cream. Hope this helps! Facial oils are teh bomb. 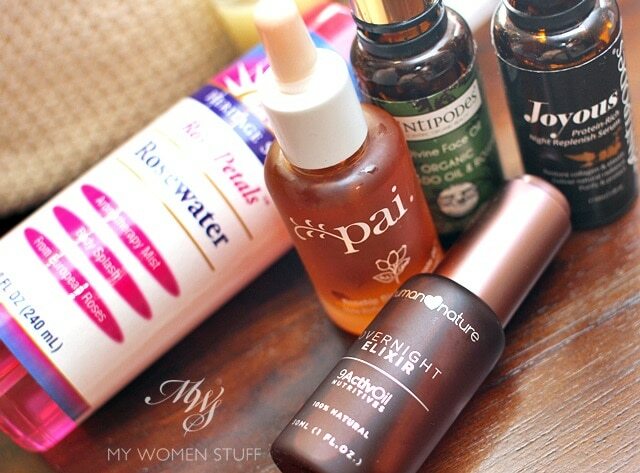 Rosehip oil (and rosewater toner) saved my skin from total meltdown 2 years back. So yeah, now if I ever met a rosehip or a rose farmer I’ll totally ask him to marry me haha. But yeah, blended oils are expensive. I was using pure oils but since my skin’s improved they feel a bit too thick. Now I use the Antipodes Divine oil at night after serum. Might try mixing the oil into the serum, great idea! BTW, which facial oil is your current fave now? Love using facial oils! They are truly so beneficial..even for my skin type which is combination and acne prone it works so well! Currently loving grape seed oil..it balances out my skin so well and gets absorbed immediately! Argan oil is tad bit too heavy on my skin and didnt do much..apart from these i absolutely love Clarin’s Lotus Oil and Orchid Oil! Thanks for sharing, Parita! I love that you’re loving using facial oils and that you can vouch for using it even with combination and acne prone skin. I too found Argan oil a bit too heavy for my liking and Clarins Lotus oil really helped to rebalance my skin when I was breaking out so I have a soft spot for it too! I need to try the Orchid oil. I’m told it’s lovely and hydrating for drier skins like mine. I use 100% jojoba oil which isn’t technically an ‘oil’ (it’s a wax ester, so it’s very similar to your skin’s own sebum and hence is less ‘risky’ than a regular oil) at night before putting on my regular nightly moisturiser. Apparently whatever you layer on top of jojoba, sinks deeper into the skin because it acts as a carrier. I’m not sure about this, but my skin loves it either way 🙂 I never over use it either, a drop or two will do! I use coconut oil during nightime and I use it as it is. Massage it into my face and let it be. Multifunctional too, as i also use it as my hair leave in conditioner before going to bed. Now I use oils instead of moisturizer and currently loving my Josie maran argan oil. I first found out about the 3 ways to use oils (very similar to the methods youve shared) through Clarins a few years back. And I haven’t stopped using a face oil since then. I’ve also added one more way to use it.. in a Mask (M too! haha), I use the Clarins Lotus Oil mixed in clay masks. Great job of writing up a guide, I know it would have definitely helped me those many years ago! Do you mist your face after applying serum and before applying facial oil? I do, if I feel that my skin is dry. I don’t usually let my products dry between applications unless it is recommended to. So, if I apply an oil over damp serum then I don’t mist. If I feel that the serum has absorbed too quickly then I do. But I am not uncomfortable working with oil textures, so I don’t mind oil going onto dry skin. Using a mist helps to create a hydration sandwich layer as well, which your skin may enjoy.